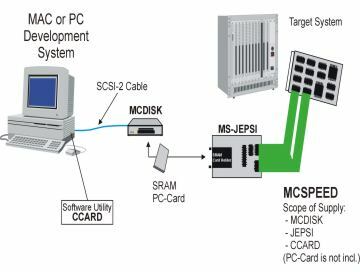 The package MS-MC Software Production EPROM Emulator (for a faster) Design , or MS-MCSPEED, is a versatile tool that eliminates the task of programming EPROM's during the software development stage. Compared to the conventional way of testing new software on the target system (i.e. with a programmed EPROM) the MCSPEED package dramatically speeds up test turnaround time. No need to program EPROM, test it out, realize there are some software bugs, erase the EPROM, program it again, test again, . The package consists of three different items, each of which must be ordered individually. First, the MS-JEPSI, which is the front end of the emulating device, it provides the flexibility required to emulate one 8-bit, two 8-bit or one 16-bit EPROM. All necessary cables are included and the MS-JEPSI is ready to run. No memory card is included with the MS-JEPSI. The part which programs the memory card is the MS-MCDISK-E-5 in conjunction with the CCard utility for IBM-PC or compatible, or CCard utility for Macintosh users. 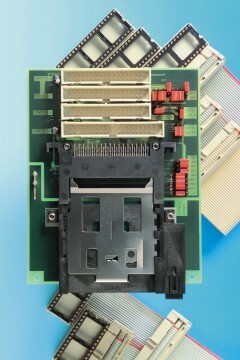 IBM-PC users also need an SCSI controller, (ADAPTEC 1540C-M/1542C-M with ASPI interface. The Macintosh User requires a MPW shell or compatible tool to let CCard work.